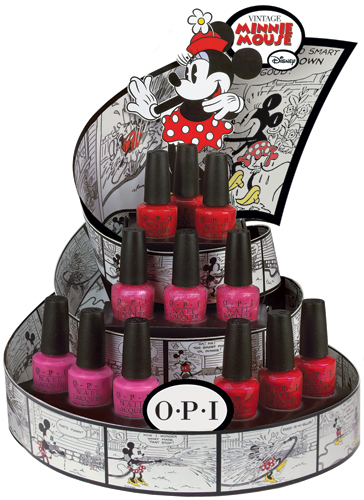 OPI launches Vintage Minnie Mouse, including four limited edition nail lacquers, for summer. Created in honor of Disney’s beloved character, the colors encapsulate Minnie Mouse’s irresistable charm in playful, pretty shades of pink and red. Don’t squeak it – SHOUT IT! This confetti light pink is tops! Tell me how much you love this magenta shimmer. You gotta pink what you gotta pink. As with all OPI nail lacquers, Vintage Minnie Mouse by OPI contains no DBP, Toluene, or Formaldehyde, and features OPI’s exclusive ProWide™ Brush for the ultimate in application. This limited edition promotion will be available beginning June 2012 at professional salons and Spas for $9.95 CAN suggested retail for each Nail Lacquer. I'm really excited about this collection! I absolutely love pink and glitter polishes, so I cannot wait to get my hands on these! Are you as excited as I am for these polishes? This looks so fun! Can't wait to see if our Ulta gets them in!! Im loving the glitter one!